Theresa May’s new manifesto will force elderly people to pay a larger part of the costs of their care. 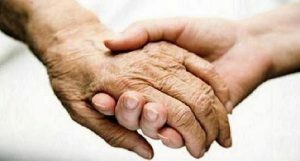 By including their home in estimating their assets very many of the elderly will be forced to raise money for their care by releasing the equity in their property as soon as they need any care. Only when their total assets fall below £100,000 will the council consider helping. There is no evidence that the government will make up the present shortfall in social care funding so even that threshold is probably not to be taken too seriously. Theresa May has delivered her manifesto for the next Tory government. One major change is a new long-term plan for elderly care. The elderly have to pay for their own care no matter how much it costs until their asset value falls below £100,000. All their assets such as savings and income are taken into account and now, for the first time, it includes their home. When they die any money still owing has to be paid for by selling their home. At present that sale is not enforced if the home is occupied by a spouse or dependent relative. The manifesto makes no mention of the possibility of delaying the sale in future if that home is occupied by a spouse or dependent relative. Very few properties in the UK are worth less than £100,000. Only in the Outer Hebrides does the median home value approach that. The median value in the UK is just under £250,000. This means that virtually everyone living in owner occupied (but not rented) accommodation will have to fund their own care from the beginning. Typical residential care costs in the UK are in the region of £40,000 per annum while the cost of home care averages around £8000 per annum. There are 426,000 individuals in residential care and the median time that an individual spends in residential care is about 15 months. Councils are not obliged to pay for social care. It is very much up to them to decide what they will pay for and indeed any additional funds provided by central government may or may not be used for social care. Consequently, only 20% of older people have their care paid for by the council. They are more likely to provide a loan to pay for social care, to be repaid on death by selling the property. At present if you have less than £23,250 in assets and you are living in your own home the council will be obliged to help you. For someone living on a state pension with little in the way of savings then the would get help at present. However in future you will have to pay for this yourself by raising money as best you can. Only one in four of us will actually go into residential care, the rest being looked after at home with, if you’re lucky, some local council support. These changes are likely to force people to use equity release, something that is a pretty stressful operation for most. When done at short notice the yield can be very poor. Only once the residual value of your assets including your property is below £100,000 will you be eligible for help and even then you’re quite likely not to get any. For most elderly people in need of care it simply isn’t practical to downsize to a smaller property. The stress of doing that could well be fatal. Some will see this as a right and proper way to force people to pay more towards their care by clawing it back from their estates rather than letting them pass it on to future generations. Very few need long-term residential care although that is something that many worry about. The proposed changes undoubtedly will increase greatly the stress that comes with old age and increasing infirmity. Some will claim that this is essentially the Death Tax proposed by Labour before the 2010 election. However that was part of a move to generate a universal care system for everybody. This is another Tory policy designed to squeeze money out of the elderly and infirm. It is surprising that the Tories want to penalised pensioners who are their most loyal and enthusiastic voters. Increasingly they are being told that in Tory Britain you are simply on your own. It is a very unfair, punitive policy. It will punish the elderly who become infirm, long term disabled and those suffering dementia, whilst those fortunate to remain able will not be affected. A lottery in other words, or luck, and breaks away from the universal care system. It also risks creating a system where other long term health conditions (also expensive) could creep in and require additional payment to that already paid in e.g. Parkinsons, MS. A universal system re tax/NI should be considered, or is health care no longer a right.